That was the headline from NBC online today. Really?? 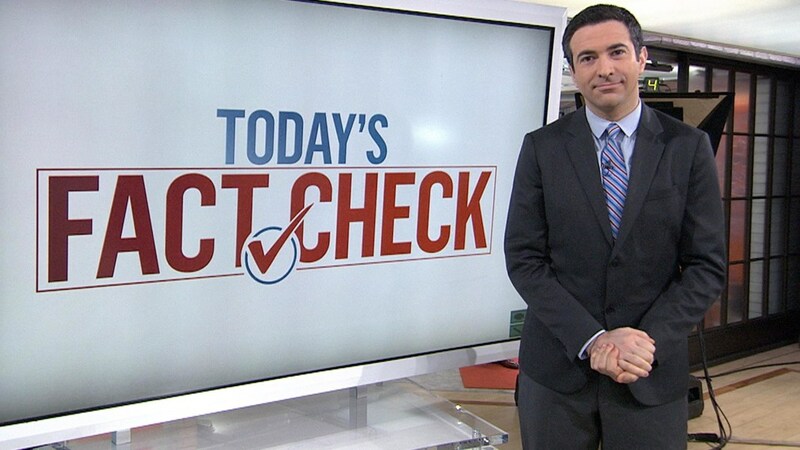 I knew NBC was incredibly good at spreading false liberal propaganda, but today’s headline really takes the cake. What determines a “hate group” in their eyes? I read the names of great people like Brigitte Gabriel and Pamela Geller, who work tirelessly to fight the murder of innocent people from islamic terrorism on a daily basis, and, THEY are considered people of “hate”? Notice, in the article, we get quotes from CAIR, who has been designated by the UAE, a terrorist organization. The journalist also fails to mention that David Duke also endorsed Keith Ellison for DNC chair…a man who has ties to the Muslim Brotherhood and Hamas. The article does a great job of blaming Donald Trump for this rise in SO-CALLED hate groups, simply because he wants a “PAUSE” in taking in refugees from countries with high rates of islamic terrorism. My question is, when will the SPLC designate the over 80 islamic terrorist groups murdering on a daily basis around the world, a “hate group”? I know the answer….NEVER! 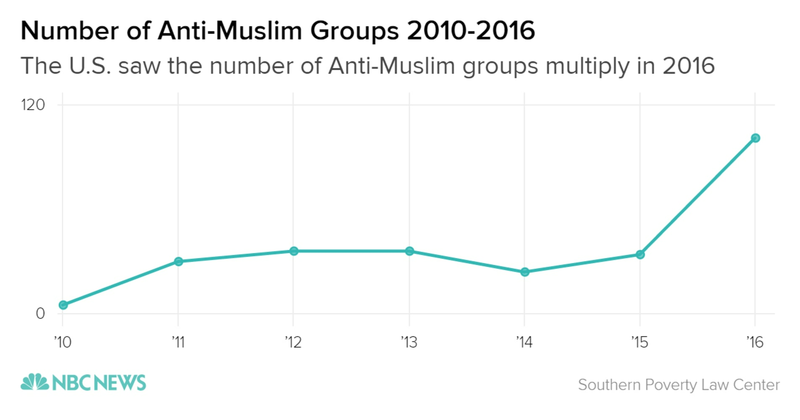 “ The number of hate groups in the United States rose for the second straight year in 2016, with a sharp spike in those spreading anti-Muslim messages, according to a civil rights group. In its annual census of hate groups and extremist organizations, the Southern Poverty Law Center (SPLC) said the overall number of hate groups grew from 892 in 2015 to 917 in 2016. 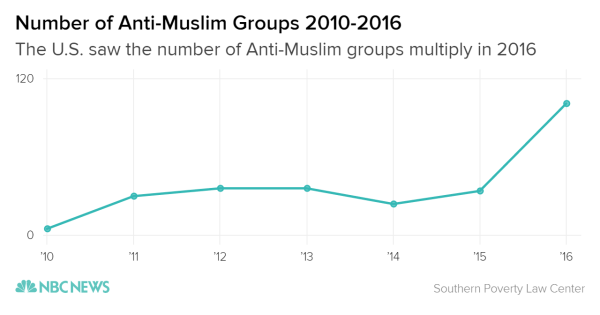 But the number of anti-Muslim groups nearly tripled — from 34 in 2015 to 101 last year. The SPLC said the tenor of the presidential campaign energized certain sectors of the hate movement. Donald Trump won the backing of white supremacist David Duke, a former Ku Klux Klan grand wizard. Trump accused Mexican immigrants of being “rapists” and “criminals” and a controversial executive order temporarily barred entry to the U.S. for citizens of seven Muslim-majority nations. “There is no question that the organizations that aligned themselves with the Trump campaign saw their ranks grow, their prominence grow and their online readership grow,” said Heidi Beirich, director of the SPLC’s Intelligence Project. Beirich told NBC News that the number of hate groups has grown over the past two years since dropping to an 11-year low in 2014. 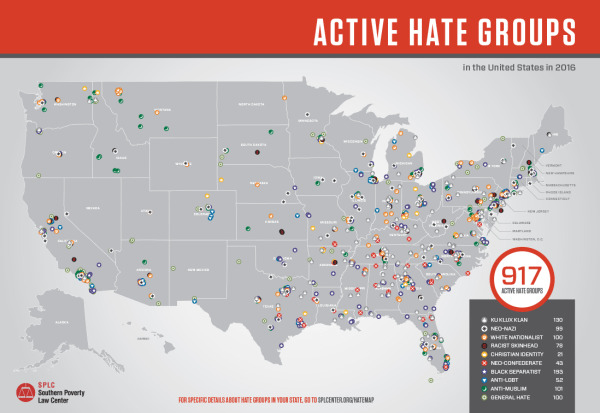 To maintain its annual count, the SPLC assigns people to watch different hate groups to see whether they develop or fall apart. The groups are not difficult to identify, because they are actively trying to spread their message, according to Beirich. 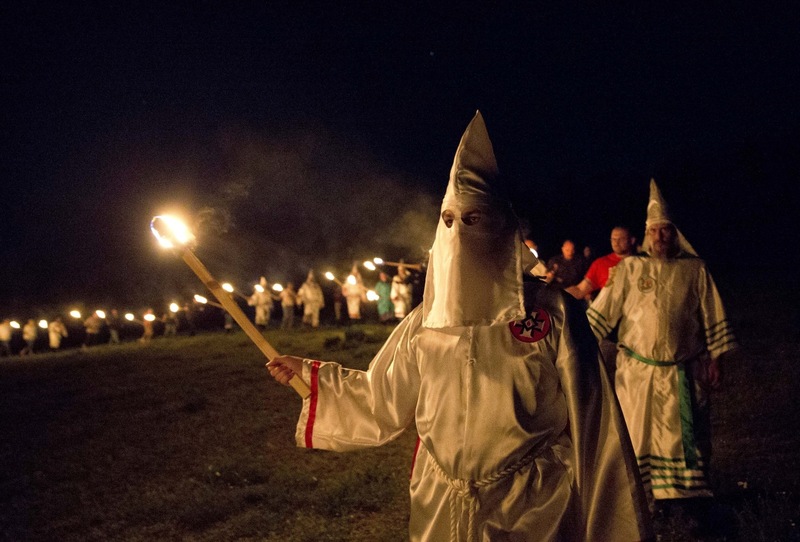 However, the SPLC found that organizations like the Ku Klux Klan had become less popular. The SPLC interviewed 10,000 educators after the election. Eighty percent said fear and anxiety grew among students after Election Day, especially among students who were immigrants, Muslims or African Americans. The annual census, which was released Wednesday, found that most of the groups created to bolster those messages in 2016 were specifically anti-Muslim. The SPLC alleged Trump’s rhetoric during the campaign encouraged the creation of anti-Muslim organizations and legitimized them. He pledged to create a database tracking Muslims in the U.S. and falsely claimed that thousands of American Muslims celebrated the terrorist attacks of Sept. 11, 2001. According to a Pew Research Center Poll published Wednesday, nearly a third of Americans do not feel an affinity toward Muslims. Hooper noted the controversial affiliations of members of Trump’s inner circle in the White House. Senior White House strategist Steve Bannon invited SPLC-identified anti-Muslim figures — such as Frank Gaffney and Pamela Geller — on his radio show when he was executive chairman of Breitbart News. And White House counselor Kellyanne Conway worked as a pollster for Gaffney’s Center for Security Policy, which the SPLC calls a hate group. Trump has not directly addressed the spike in hate crimes. When asked Wednesday about the spike in anti-Semitic incidents across the United States, Trump first cited his electoral victory and the support he had received during the election before addressing the issue.